In Paper > Magazines > Show & Tell. I like watching online auctions for local or Provincial historical items. I recently came upon this article printed in the June 11, 1899 issue of the paper Scientific American. I immediately recognized the name, location & content of the article, as the inventor & his story are included in a local history book. 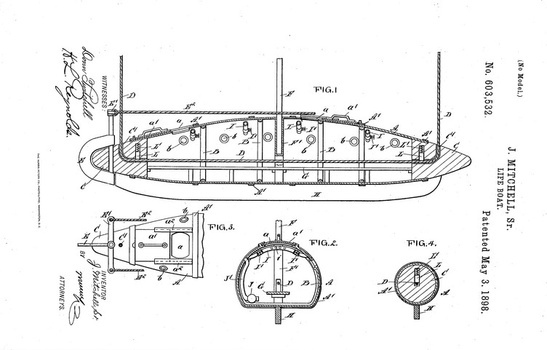 Inventor: James Mitchell Sr. born in Hawick, Scotland in 1830. James Mitchell traveled to Canada twice the second time was in 1854 & the trip lasted 76 days (perhaps it was on this long journey that he had time to contemplate the inadequacies of the current design of lifeboats). He lived for some time in Ontario working as a building contractor & operating a lumber yard. In 1882 Mr Mitchell & his sons traveled west to the end of the CP rail line which had reached present day Oak Lake, MB. To register a homestead they had to walk to Birtle, MB, a distance of 50 miles. While walking there they would have passed through the area that they would homestead, which is only four miles west of where I live. His homestead overlooked the Assiniboine River Valley, he soon built & operated a ferry on the Assiniboine River. He was a great reader & one of his favoutite papers was "Scientific American", of which the above article is from. 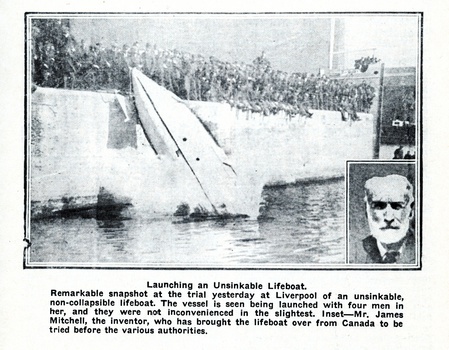 Mr Mitchell had a love for the sea & it was this that led to the design & building & testing on the river of his lifeboat. On his 80th birthday (1910) he set out for a promotional trip to Halifax, NS, Liverpool, UK & Le Havre, France. The lifeboat was tested at each location & was well received, but no commercial success came from this venture. As is the case with many inventions. His descendants still live nearby. very cool!!! love it and the history as well!! Thanks for the love & the comment on this one Sean. Thanks for the love on this one Phil & I'm glad you found the info interesting. A big thank you to Julie, B'buss, mikelv85, agh, Sis, Kevin, hotairfan, Ted, Gargoyle & T'man. Thanks for the love on this kyratango.